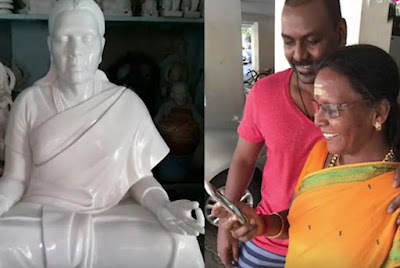 Raghava Lawrence decided to build a temple for his Mother Kanmani in the birthplace of his father Poorvirundhavali in Tamil Nadu. The temple work began in 2014. It was supposed to be ready by 2015, but delayed in a few years. The temple will come in the same facilities where the Raghavendra Swamy temple was built by Lawrence. The 5ft Statue of Lawrence's Mother was specially designed in Rajasthan. Lawrence plans to set up his Mother Statue in the Temple on the eve of the Tamil New Year in March 2017. A 13-foot Gayatri Devi statue will be installed just behind the choreographer's mother idol. The opening ceremony of the temple will be a great way. The choreographer, who became director, says it was his dream to build his mother's temple when he is alive. He also wants to write a book about his education for his mom. Chiranjeevi Not In Top 5! 'Local' Nani ready for MCA! Is this hype reducing the trick Bunny? Balayya's 101st film: Deadly Combo! Shruti Haasan roped in for Sangamithra? Whom did Rajamouli surprise with his Call? Photo Story: Angel On The Earth!